The new MS 251 C-BE featuring Quick Chain Tensioning (B) and ErgoStart (E) is ideal for a variety of applications, from cutting firewood to timber construction. This high torque engine is easy to start and comfortable to use, with a high cutting performance. 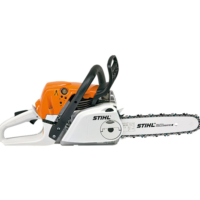 Emissions are cut by 70% and fuel consumption is up to 20% lower compared to a STIHL 2-stroke engine of the same power output without 2-MIX technology. The current model offers a 18″ bar.